In this industry, getting products to market fast is key. And what better way to do this then by having a Stratasys 3D printer in-house to speed up R&D, prototyping, fit testing and design iteration processes? Especially, if companies can use the same 3D printer for both prototyping and tooling! Let's assume all three companies have the same 3D CAD and design software and that their design cycle is the same. When they go to make a prototype, they will likely experience the following based on the resources and technology they have on hand. 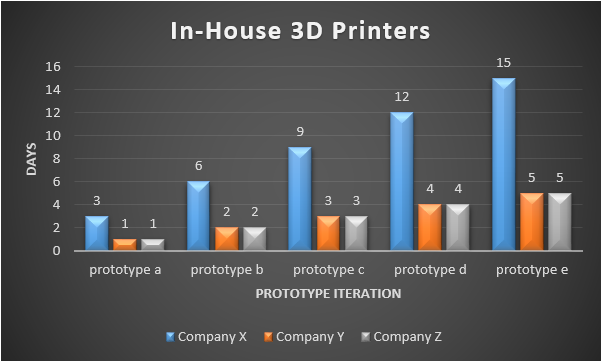 Companies Y and Z that have 3D printers in house can print overnight, verify, test and redesign the next day and then begin the next prototype overnight. Meanwhile Company X, who does not have this 3D printing capability, has to deal with what we call a "Design Freeze," where the process gets put on pause to submit orders, get approvals and wait for parts to be shipped in order to begin testing. In a project planner, this will greatly increase the timeline of the product, and therefore, the time to market will be higher than the other two companies. While both Company Y and Company Z have 3D printing technology in-house, only Company Z has the capability to print prototype 3D Injection Molds (with awesome materials like the new Digital ABS Plus). This means producing a prototype mold will vary between in house capabilities versus outsourced capabilities. 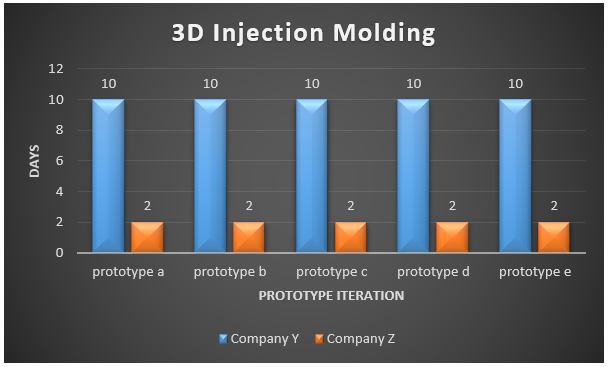 In the case of a Stratasys 3D injection mold, it can range from hours to 2 days depending on the complexity of the mold. Meanwhile, the rule of thumb is about 10 days for an aluminum tool. As you can see on the image above, if the company ever has to go through multiple iterations, the difference in time will be drastic. For example, five (5) iterations would take 50 days compared to 10 days. Plus, this is not taking into account the cost of making the tooling which is anywhere from 60%-90% less expensive than traditional prototype aluminum molds. Watch our on-demand webinar, Engineer's Guide to Mold Tooling, to learn more about the benefits of molding.